Douglas College is getting a makeover. The 0600/1600 area of the New Westminster Campus will undergo a renovation that will see 22 upgraded educational spaces, including new classrooms and lab spaces to keep up with the growing student population. 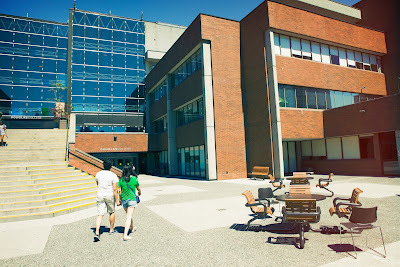 The 3,000-square-metre renovation will enhance your learning experience and make room for new space dedicated to the Engineering Foundations Certificate and Engineering Essentials program, as well as other programs that align with the BC Skills for Jobs Blue Print. This will be the largest renovation at New Westminster campus since its opening in 1982. The project will include classroom upgrades such as energy efficient lighting, HVAC systems and state-of-the-art AV technology for instructors. Construction preparation and demolition kicks off Feb. 8, with work carrying through to August. Construction will take place on the south side of the campus, along Victoria Street. As with any construction, there will be occasional noise and minor disruptions. Some classes will be moved to new rooms to ensure the expected noise does not impact students or teachers. As well, traffic on Victoria Street will be single-lane only from February to August. The sidewalk on Victoria Street may also be closed as construction progresses for safety reasons. These areas will be blocked using construction fencing. There may be temporary closures to parkade entrances during deliveries.